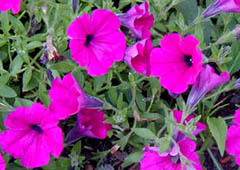 Wave Petunias are a popular group of hybrids valued for their large, colorful blooms and unique creeping growing habit. Spreading up to 4 feet, these plants add huge mats of color to gardens and containers. Unlike most petunias, these bloom without getting leggy by midseason. Prefers moist but well-drained soil. Flowers are up to 4� wide and trumpet-shaped. not native to North America - Hybrid with South American parents. Propagate by seed - Sow the seeds indoors 10 to 12 weeks before the last spring frost, leaving the seeds uncovered as light aids germination. 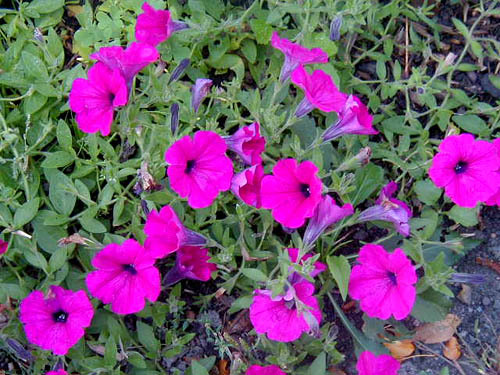 Pre-started petunias are readily available at retail outlets. Wave hybrids don't need deadheading or cutting back like many other petunias. Fertilize every two weeks until midsummer. �Purple Wave�: deep purple flowers with darker purple centers. Has the greatest spread of all 4 varieties. �Pink Wave�: bright pink flowers with pale pink/white centers. �Rose Wave�: deep rosy-red blooms with white centers and darker rose veining. �Misty Lilac Wave�: Pale lavender flowers. Has the largest blooms of all 4 varieties.